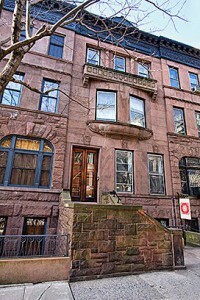 New York Brownstone for Sale! How is it possible to fit the sprawling interior of an English manor house behind an Upper West Side brownstone façade? Ask the architect of this extraordinary home. By building all the way back on the first two levels and simply raising the garden up onto the roof of the second level, he added thousands of interior square feet without sacrificing outdoor entertaining space. Now you too can enjoy the fruits of this space-maximizing ingenuity – boasting generous indoor and outdoor living areas, this house lets you have your cake and eat it too. The sheer depth of each room on the parlor level will take your breath away. The formal dining room is a masterpiece replete with original detail and drenched with light from a side bow window overlooking dozens of townhouse gardens. Original parquet floors, original fireplaces with hand-carved mantelpieces, and original wainscoting and paneling highlight the historical character of the property. Plenty of bedrooms ensure that even the largest family will have space to grow, while spacious sitting rooms make large-scale entertaining easy. Currently configured as an upper triplex and a separate garden level floor-through apartment, this New York brownstone would be an extremely easy conversion to a single-family home. A fun fact: this brownstone is located on Edgar Allan Poe Street (West 84th Street). Just across the street was the Brennan Mansion, where Poe wrote one of his most famous works, “The Raven.” Indeed, this property’s dignified mahogany woodwork, giant fireplaces and hand-carved mantelpieces hearken back to Poe’s era.